Over the Hill on the Yellow Brick Road, I noticed an elderly nose limping along with a suitcase. I caught up with her and started a conversation. Hey nose, where are you going? NOSE: I’m outa here. I’m leaving Over the Hill on the Yellow Brick Road. I need to move on. I don’t know what else is out there for me, but I need to find it. If not now, when? But…I’m scared. NOSE: About not being blessed. NOSE: Here’s the thing. I’ve always been around others who know me. They bless me every time I sneeze. I’ve had so much emotional support in my life Every time I sneeze, someone says “Bless you!” And when I’m stuffed, I hear, “Bless you! Bless you! Bless you! Bless you!” Constantly! I’ve become dependent on it. I can see how that could happen. NOSE: But! You know when NO ONE blesses me? When I’m in a place where I don’t know anybody! Like, let’s say I’m on a random bus or train, or in an elevator. If I sneeze, no one blesses me because they don’t know me! Or…if I sneeze and people do say “bless you,” they mumble it awkwardly, like they’re not sure if they should have said it in the first place. I know that’s gonna happen again and again and again if I’m not with others I know! I won’t be blessed! Maybe you should trust the silence. And trust your instincts even if you’re not feeling supported or blessed. NOSE: What makes you so sure about all this stuff? Because I’m going through the same thing, but I’m one step ahead of you. As I’m growing older, when I want to try something new, I’m finding I don’t care as much if other people don’t “bless” what I’m doing or approve of it. Maybe it’s just something that happens with age. NOSE: I see your point. If I feel centered in what I’m doing, I’m not as afraid. NOSE: You must be in therapy. You know? Maybe you and I are blessed in a different way. Maybe we’re blessed that we have the freedom, time and health to go out in the world and experience it differently. It’s a privilege. It’s a different kind of blessing. NOSE: I can get into that. Thanks for the suggestion. Over the Hill on the Yellow Brick Road, I passed an abandoned house. In the attic window, I noticed a tarnished Emmy Award. Since the house was empty, I wandered upstairs and had a conversation with that poor, neglected award. Emmy Award, what are you doing up here all alone? Yeah. I’m surprised you’re not made of real gold. EMMY AWARD: That’s my million dollar secret. And since I’ve been sitting here in the window for years, the sun has faded me to silver. Wow. On a positive note, your upper arms look amazing! I mean, holding up that ball for years has given you great upper body strength. Your arms are so sleek and toned. Mine are so flabby I bet if I moved them up and down fast enough I’d fly away. EMMY AWARD: That’s enough about my arms. Here’s the bottom line. There was a time when I stood for someone’s dream come true. I stood for that happy time. It was amazing, but that ship has sailed. I represented a dream, but I don’t think it’s possible for two dreams to come true in a lifetime. I don’t agree. I think no matter how old we get, our creativity can carry us to new places if we let it. More than one dream can come true. EMMY AWARD: Not for me. I’m pretty much forgotten forever. I’m not seeing myself standing for anything important anymore. Actually, I have an idea. I write a blog. Other bloggers read it, make comments, or let me know they “liked” a post. At this time of year, I’d love to let them know how much I appreciate them. They add so much to my life. I’m most grateful. EMMY AWARD: So what does that have to do with me? EMMY AWARD: The Blemmy. I like that. Has a nice rhythm to it. I’m in. Great! Okay…so……dearest Blogger friends who are followers, commenters, or who have tapped the “like” button on “Over the Hill on the Yellow Brick Road,” I am presenting this Blemmy Award to YOU. IF YOU ARE READING THIS POST, YOU ARE A BLEMMY WINNER. Your category? Best Blogger in a Supporting Role. Thank you thank you thank you for supporting my creativity. And! Since you’re on the Red Carpet, if you’re up for writing your acceptance speech, I’d LOVE to see it in the Comment Box! Your acceptance speech can include thanks to other bloggers who have helped you become the blogger you are today (please include their links). LOL. Happy Holidays to you all, and may all your dreams and wishes come true. Over the Hill on the Yellow Brick Road, I passed an aging ambulance in front of a deli. It was lunchtime, so the driver was inside getting a hot pastrami sandwich. I started a conversation with the ambulance. You know, I’ve always wanted to talk to an ambulance. This is an honor. AGING AMBULANCE: Thank you. But…why? Well…I have a dream I don’t share with many people. I’ve always wished I could have an ambulance of my very own. Nope. I started dreaming about it when my children were in elementary school and had playdates in my house. I worried what would happen if someone got hurt. It would have been so calming if I knew an ambulance was parked in my driveway at all times. And now that my kids are young adults and my husband and I are older, having our own ambulance would totally calm our nerves. I mean, for example, last week my husband had bad stomach cramps and chest pains late at night. It turned out to be a stomach virus. But since he’s a bit older, when he was in pain, we were concerned it might have been something more serious. Having an ambulance in our driveway would have been a dream come true. AGING AMBULANCE: Well then, I’ll let you in on something that embarrasses me. As I get older, my exciting, dramatic life as an ambulance doesn’t feel exciting anymore. It feels frenetic. The sound of my siren is just overwhelming noise and gives me a headache. I can relate. It’s embarrassing to admit, but large cities feel that way to me these days. I used to find all the sounds and crowds of people stimulating. Now I’d rather be in a quiet place. I’m changing. AGING AMBULANCE: Me too. When I have to speed down a highway to get to a fire, I just want to go home. Or when I have to weave through traffic to get to an emergency, it’s not exhilarating anymore. I’m changing. AGING AMBULANCE: But…I still want to be helpful. Somehow. Somewhere. Well then, dare I ask? Would you consider a permanent job sitting at the end of my driveway? AGING AMBULANCE: What would your neighbors say? AGING AMBULANCE: Okay then! I’m in! This is wonderful! I guess you just never know when a dream will come true. Hey Gallery, is there a manager I can speak to? ART GALLERY: I’m the manager. As long as my walls don’t crumble and my plumbing works, I’ll keep running this place no matter how old I get. Yeah—you must be really proud of all that you hold on your walls. ART GALLERY: It means the world to me. I carry thoughts, dreams, visions, statements. I carry the hearts of so many gifted people. Totally. In that case, would you mind if I set up an exhibit here? There are five bloggers who have invited me to guest post or have shared my blog on theirs. Their art, photos and writing is so beautiful. As a way to say a heartfelt thank you and let the world know about their work, can I set up an exhibit of links to some of their best creations? ART GALLERY: Absolutely. I’ll keep it here forever. 4.Elaine did a very kind shout-out to my blog. Elaine paints and writes while “living and following the light.” I especially love her fantasy work. Here’s her display of amazing paintings. That’s all for now! Hope you enjoyed the art show! In a mall Over the Hill on the Yellow Brick Road, I heard a strange moaning sound. I realized the sound was coming from an older vampire bat flying beside me. I figured I’d try to help. OLDER VAMPIRE: Obviously yes! I’m in pain! I’m too old to rest in my coffin box! It’s killing my back! I need a mattress! OLDER VAMPIRE: Well that’s the whole ridiculous problem. I came here to the mall to buy a mattress to put in my coffin. But there are too many kinds! I don’t know which one to get! Why can’t there just be one mattress? I went through the same thing last year. I wanted to buy a mattress. It used to be there were soft, medium and hard mattresses. That was all. OLDER VAMPIRE. Yes, like with The Three Bears. OLDER VAMPIRE: Mattresses with memory foam! A little foam! Or a lot of foam! Or they lift your back up and down with a remote! Or they have extra coils! Or no coils! Or they’re thick! Or they’re thin! Or they’re attached to a sofa bed! Aaaaah! I can’t take it anymore! I admire you for getting angry about it. OLDER VAMPIRE: The truth is…my anger actually covers up my fear. What’s happening to me? Is there more to understand in the world? Or am I just not able to understand as well as I used to? Maybe it’s a combination. Sometimes the whole thing embarrasses me. I’m self conscious about it. So to cope, I focus on exactly what I want and reject the other choices, even if a different choice might save me money. That’s one way to deal with it. At least I don’t go insane. OLDER VAMPIRE: I don’t get out a lot during the day. Is this sort of problem just happening with mattresses? OLDER VAMPIRE: No wonder I’ve been having so much trouble flying into bedrooms. OLDER VAMPIRE: Alright already! Shut up! You’re giving me a headache! OLDER VAMPIRE: So, what should I do about the mattress? How did you resolve your problem with it? Well, instead of asking a million questions and trying to understand how every mattress works…I went to a store that offered a special deal. You can buy a mattress that seems comfortable, but after a month if you don’t like it, you can exchange it for a different mattress in the store. OLDER VAMPIRE: I like that! I’d like to go with your mattress deal if you don’t mind directing me to that store. I’d be happy to. Just keep in mind, if you’re thinking of returning the mattress, don’t drip blood on it. They won’t take it back with stains. OLDER VAMPIRE: I don’t know if I can pull that off. Well then, just buy a mattress protector. They sell lots of them in Bed Bath and Beyond. OLDER VAMPIRE: That’s for me! Welcome to my allegorical blog for all who are aging but will always be young at heart. 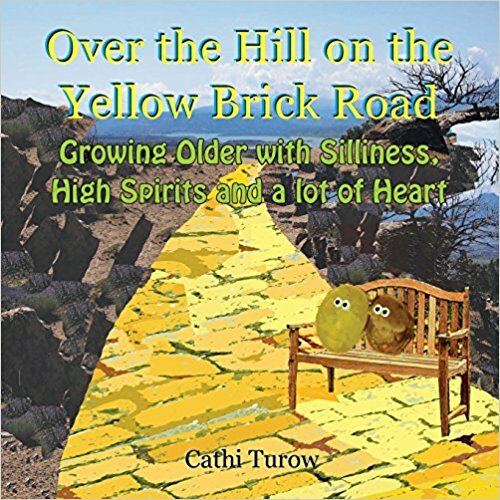 Older characters you've never met on the Yellow Brick Road look at that world through more experienced eyes. They're figuring out where they belong in the world. Please click here to follow! Conversation With…An Older, Wiser Question Mark…about losing momentum while growing older. Conversation With…A Rickety Elevator…about finally speaking out in older age. Conversation with…A tattered flag…begging to stand for something new. Conversation With…A Dried Flower…about the parts of ourselves that die. Conversation With…An Older Imagination…Dealing with what’s imaginary as we age. Conversation With…A Worn Violin Case…Trying to hold the music inside it.